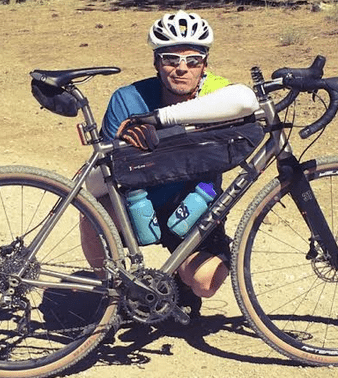 Editor’s note: We welcome back Grannygear with his opening piece about pedals suitable for gravel/back road travels. 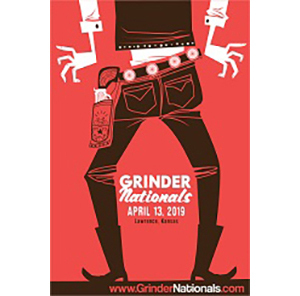 While we understand that this isn’t a comprehensive look at all the choices out there or even all the types of pedals, we chose to focus mainly on what we know works really well for most people. In other words, you probably can’t go wrong with any of the choices presented, but you may find one that suits your needs best. Now here is the Introduction with a bit of history of the clipless pedal for off-road riding as remembered by Grannygear. Yes………he was there! 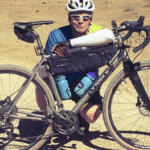 The Riding Gravel Pedal Round-Up: Introduction- by Grannygear Riding can give one time to ponder life’s great mysteries: Ultimate justice, good and evil, and choosing the right bike parts. And so, while I was out on my gravel bike the other day, I found myself wondering what pedals were most used on bikes in this genre. Racers, especially those coming from a road background, Pros, etc, might have different needs than a pure adventure rider and I understand many of them will use the road pedals they are accustomed to, but I would be surprised to find that many folks use dedicated road pedals as they would be pretty awful to hike-a-bike in. Flat pedals seem like a silly option too, so it remains that some kind of MTB pedal system would be the most common choice. There seems to be a decent amount of walking in gravel riding/racing. And mud. Lots of mud potential here, seeing how the bulk of the rides are in the Mid-West. Not all clipless pedals were good ideas! Here is an old Onza HO pedal. 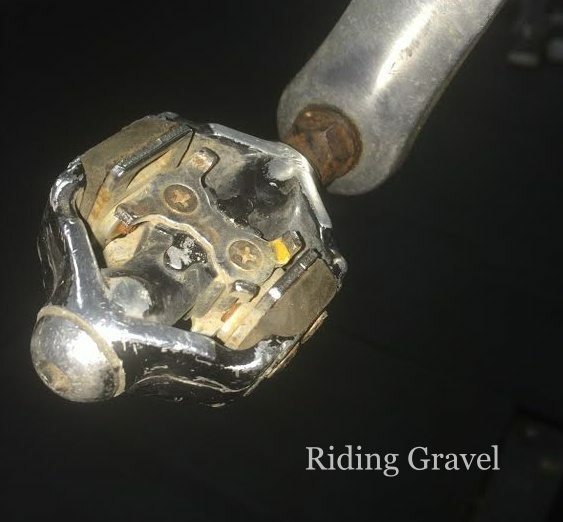 So I asked Guitar Ted what was the most common pick for attaching your feet to a bike in the gravel world and he figured that SPD would be the #1 pedal of choice for the masses. That makes sense. 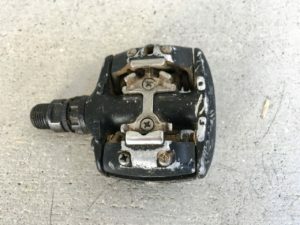 I have been on SPD since the old M-737 days when Shimano popped the first commercial SPD pedal out of their EZ-Bake Oven of cool bike stuff…circa 1990 if I recall correctly. They, and their many current cousins, were and are, cheap, tough, and effective, lasting darn near forever. But they are not all that special in mud, tending to pack up a bit upon re-entry and that can make a quick exit difficult. I am in dry So Cal so that is really not an issue for me. But our conversation got me to thinking what options there might be out there for gravel rider/racers besides the Shimano SPD models. A few emails and such followed that thought and I now have some boxes full of shiny pedals of various shapes, sizes, and approaches to getting those cranks spun around efficiently. In the weeks to follow I will be running through some pedal systems in the next few articles to see what is what and comparing them to what I feel is the Gold Standard. Stay tuned as I ‘clip in’ for the good of all mankind and gravel riders everywhere. It’s what I do…no need to thank me. The Gold Standard: Shimano Pedaling Dynamics Before SPD came along, with its odd looking pedal and little metal ‘tabby looking’ thing screwed into the bottom of your cycling shoe, we rode mostly with a cage-type pedal, usually from Suntour or Shimano, with a toe clip and strap set-up attached to it. It worked but it had some drawbacks. If you ran the toe straps too tight you ran the risk of not exiting the pedal when you needed to…like really needed to NOW! If you were not in the toe clip, but rather pedaling on the backside of the pedal, the toe clip and strap hung down like a deadly drag line, awaiting it’s first chance to snag on something and send you over the bars. Getting started on a steep trail was a good trick too, taking lots of practice to accomplish. Anyone remember WTB Toe Flips? I still have some bolted to an old pedal. Ah, the good old days. The “old daze” of straps and WTB toe flips is not missed here. 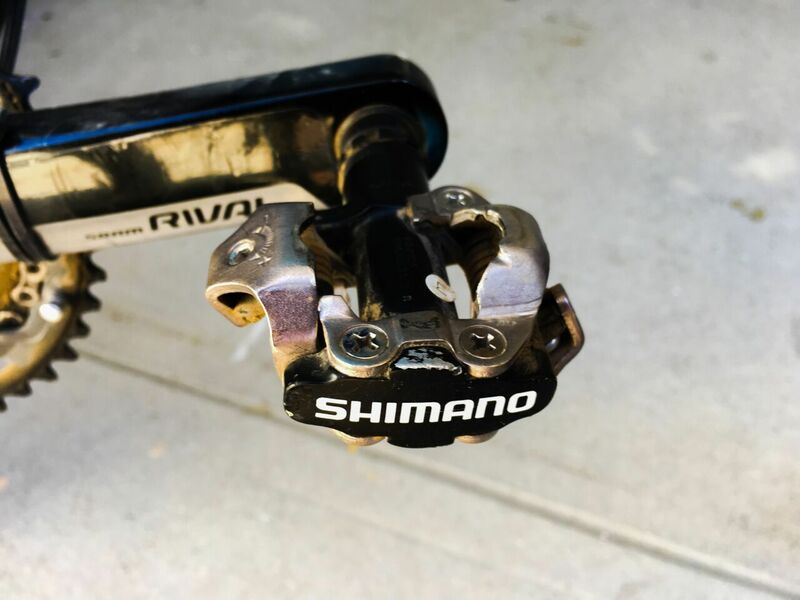 Then in 1990, if WIki has it right, Shimano came out with a MTB focused pedal and cleat system that set things spinning in the MTB pedaling world. 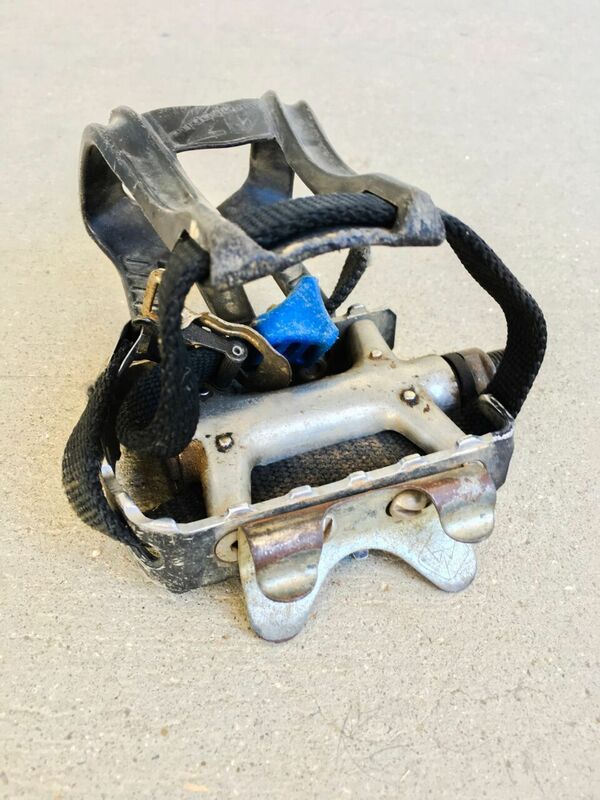 The M-737 pedal, a chunk of aluminum and steel, bulbous and odd looking…I mean…how are we supposed to stand on that thing?…taught us that toe clips were gone forever. I do not miss them, although an Alfredo Binda toe strap was a truly handy thing to have all in its own right. You never knew what might need to be strapped down tight on a bike somewhere. The original clipless pedal for mountain biking, the SPD or “Spud”. I dug out my original M-737s and they spin just as smoothly as when they were new. They are beat on, scarred and well used, but they still work. Oh yeah…they are heavy at 510g a pair. Ouch. To quote that Clara Peller lady…”There’s the beef!“. The learning curve was still daunting though and many a rider who were tuned to the ‘pull up and back’ release motion of toe clips found themselves on the ground with the new SPDs that required a ‘twist outwards’ release motion. I remember grinding up a steep forest single track until I lost momentum, then in a spastic fit of wasted energy and body motions, tried to get out of a toe clip that I was not in at the moment. My SPDs mocked me as I slid headfirst down an oak leaf covered slope, filling my jersey with debris. It took me quite a while to feel confident again, but I did get back on that horse and never looked back, instead galloping into a *click* filled sunset. The bennies were tremendous. If you crashed in them, they would not mousetrap you in like a strap system, saving ankles and knees aplenty. You could pop both feet out at once instantly if you were skilled. Getting clipped in while starting on a steep hill? Child’s play compared to straps and toe clips. Only sticky mud was the Achilles heel, but we only get three days of mud here in So-Cal so those days we just got coffee and read Mountain Bike Action mags. I still have a set of 737s in my way back machine storage box (along with my Hite-Rite) and I bet they still work. You might find a better pedal for you, but SPD’s are pretty durable and nearly maintenance free. Fast forward to today and we have a bunch of options for SPD pedals, from road-ish to XC to trail models. My wife runs SPDs on her road bikes. She is not a crit crusher anyway, so the walk-ability and ease of two-sided entry and release is a boon for her, outweighing the extra weight and smaller base of support for road use. I use them exclusively on all my MTBs, never being a flat pedal guy, although I get the advantages of those for many. For around $45.00 MSRP…and I have found them selling for 25 bucks a set…you can get a PD-M520 pedal set and cleats. Wow. They are darn hard to kill too. I have never heard of a pedal spindle failing (unlike other brands seemingly famous for that) or even anyone breaking one on a rock strike, although anything can break I suppose. The bearings on the ones I have had are rebuildable/serviceable although that might not be the case on all SPD models. I either use the PD-M520, the XT version (slightly more money and lighter by a bit), or the larger bodied SLX Trail version. I did finally toss out a set of SPDs when they became rough at the bearings and would not stay in ‘tune’, but who knows how old those things were? I mean they still worked, they were just not smooth anymore. The highest praise might be other pedal designs that emulate SPD, some even claiming to be SPD compatible. 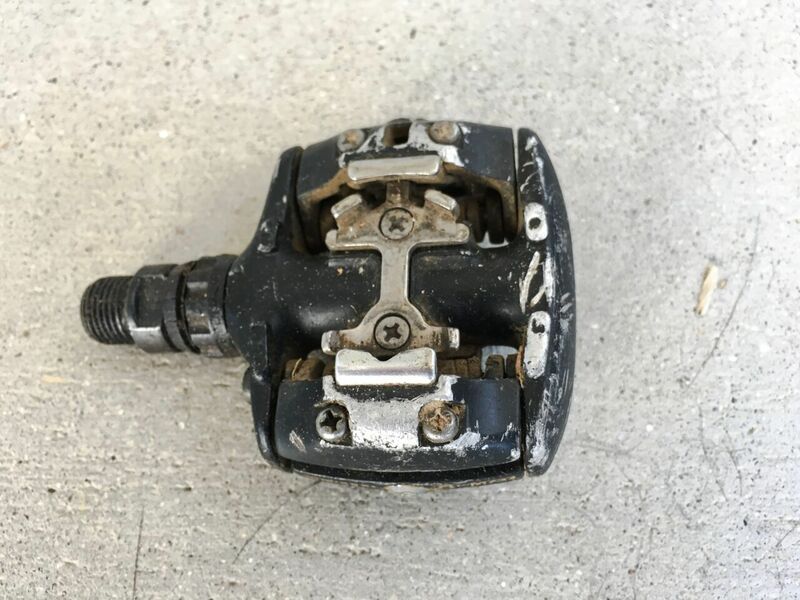 There have been some real disasters out there…remember Onza pedals, the elastomer ones? Just what we need..pedals that are easier or harder to get into depending on the temperatures. SPD is like click shifting and profiled cassettes…I would hate to live off-road without them. 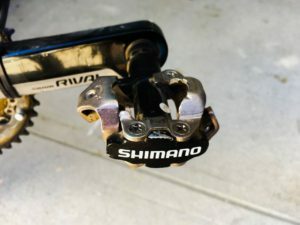 So, any pedal system looking to get a ‘shoe hold’ in the marketplace has to be really, really clever, or unique in some worthwhile way to improve on or just be even-steven with Shimano Pedaling Dynamics. The Gold Standard, and what will be my benchmark going forward, is SPD and I don’t see that ever changing. Stay tuned for the next posts in the Round-Up which will introduce the challengers to the “Gold Standard” SPD pedals. 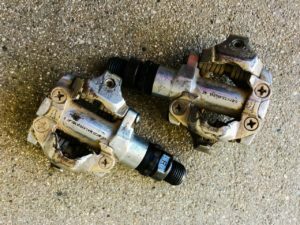 I still have a pair of Onza pedals–sitting in a toolbox drawer. Several of the elastomer inserts have been re-purposed for other things, but I can’t seem to part with these pedals. To the matter at hand–I am a huge Time ATAC fan, and have them on all of my bikes including my gravel grinder. Back in the “early days” SPD’s didn’t clear goopy mud as well as the Times of that era (based on my experience) and I never looked back. But the ATAC’s are somewhat heavy, somewhat expenses, and at least a few times a year I think about giving SPD’s another change. Have been on SPD’s since 1992. Never broken one and the cleats last for ages. ATACs are great, but there are two flavours – the ones with round bars don’t release as well as the ones with the squared-off bars. The XC8 is my sweet spot – carbon body, the good bars, light enough and plenty durable, and not much different in price than Shimano.